So to Mount Weather (and is it me or has this whole season kind of had an almost Game of Thrones like measure of transportation zooming all over America with relative ease) where, apparently the President and entire government flee and hold up in the event of the US facing a terrible disaster like nuclear war or a Trump re-election. Lilley confirms this as she used to get orders from there before everything fell apart even more than usual. Of course there are zombies so there’s some secret service agents to kill - and they find the President’s husband. This is useful because they need his keycard and eye to open the secure door. Doc uses the eye. And it’s the worst most horrible horrible horrible thing you’ve ever seen on television. There is not enough ewwww in the world. Inside Mount Weather we find the remains of congress and the senate, all zombies now who have to be killed with lots and lots and lots and lots of political puns. 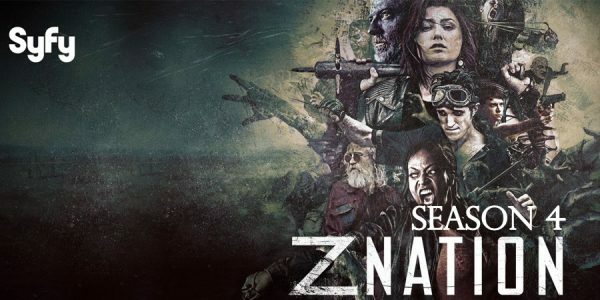 Honestly it’s corny but it works, I smiled - and it was a good balance of the zany and the serious that Z Nation does so well. We also have Doc’s snark about always having to have big show downs underground. Poor Doc. Until they finally find some living secret service agents. Agent Johnson and Agent Johnson who are not that helpful and certainly not thrilled about letting Warren speak to the President despite her talk of Black Rainbow. She happens to be passing though (the President is an Asian woman) and insists on listening. It turns out that the President and her two secret service agents are the only humans left in Mount Weather, nearly everyone else has already left. The Man with the Plan from Zona got there before them and demanded she give up her thumbs or be murdered and give up her thumbs. She chose the former and is now thumbless which is a problem since access to Black Rainbow requires a president’s thumbs - but The President points out the obvious: She is not the president who was in power when things like Black Rainbow mattered. Due to a huge death rate and a very long and complex chain of command, she was actually the assistant to the Secretary of Labour and basically President because she’s the last politician standing. So they don’t want her thumbs - they want the thumbs of the president who was in charge at the time. But first she shows them a video - which is a definite Fallout reference - showing Black Rain is. This was envisaged as a “fourth strike” weapon should the US lose a nuclear war with the USSR. They reasoned that since the USSR has a lot of territory, they’d probably have more land that isn’t irradiated so be able to breed and repopulate the world and colonise the US and ultimately win. So Black Rain, which uses drones to seed the clouds with flesh-eating bacteria which will then kill ALL THE THINGS. It’s quite nasty. So they need the old president in a near suicide mission. This involves going down to a zombie infested floor full of the cabinet, various dignitaries and the cast of Hamilton and examining each zombie one by one to see if it’s the President. They also keep poking Murphy to see if he can use his re-emerging zombie power to find the right zombie, he doesn’t. Yes, Lilley. Because she’s a soldier who swore and oath to obey POTUS and refuses to refuse a direct order from the Commander in Chief. Warren and Murphy didn’t feel the need to mention that Zona is having “problems” with their cure. Zona was falling apart when they left. Why did the Man With a Plan cut off the President’s thumbs if she’s on side? This is when Lilley changes sides again - because following the President’s orders takes second place to wiping out all but a chosen few members of humanity. She shoots the President; insisting a soldier is required to disobey any order that is manifestly unjust. Wait, couldn’t they just destroy the cylinders? And the President’s thumbs for that matter? I mean we’ve just learned that Warren is basically the catalyst for Black Rainbow all she has to do to stop it is Not Turn Up. Head back to Canada. Or Mexico. Or anywhere but DC.